Remember last year’s puzzle about the Cambridge Spy Ring (no 4375, Five One-time Pads) and before that the Christmas truce of 1914 (no 4325, Christmas Truce)? Well they were by Poat. I think that he’s come close to tripping me up, but I’ve managed to escape unscathed. This week’s Buried Treasure reminded me of Merlin’s Olde Treasure Hunt from ten years ago. It was based on the Sherlock Holmes’ story The Musgrave Ritual, and required us to find and identify the Ancient Crown of England in the grid. That did trip me up — indeed, the puzzle had the fewest number of entries for 2006. Having said all that, I’m not 100% sure that I solved this week’s puzzle correctly! But first things first. Nothing too complicated in the grid, just seven cells with clashes where both letters, side by side, would reveal an instruction relating to the unchecked letters. I had only 45 minutes before my Monday visit to the local pub, so a quick scan through all the clues seemed the best way to start. As I strode down the road, I had a pathetic six entries under my belt. The following day, and I was up early and two hours of steady solving saw significant improvement and over half the grid filled. The session started with trying to untangle the long entry 25ac in the middle of the grid Set clue for university entry with charges going the other way (13) which was an anagram of clue for u entry, COUNTERFLEURY. It ended, at about 7:30am, with Class swot can do this as tragic hero in Old Norse (8) (for which good old Noggin the Nog initially came to mind) giving OUTLEARN (UT LEAR in O N). 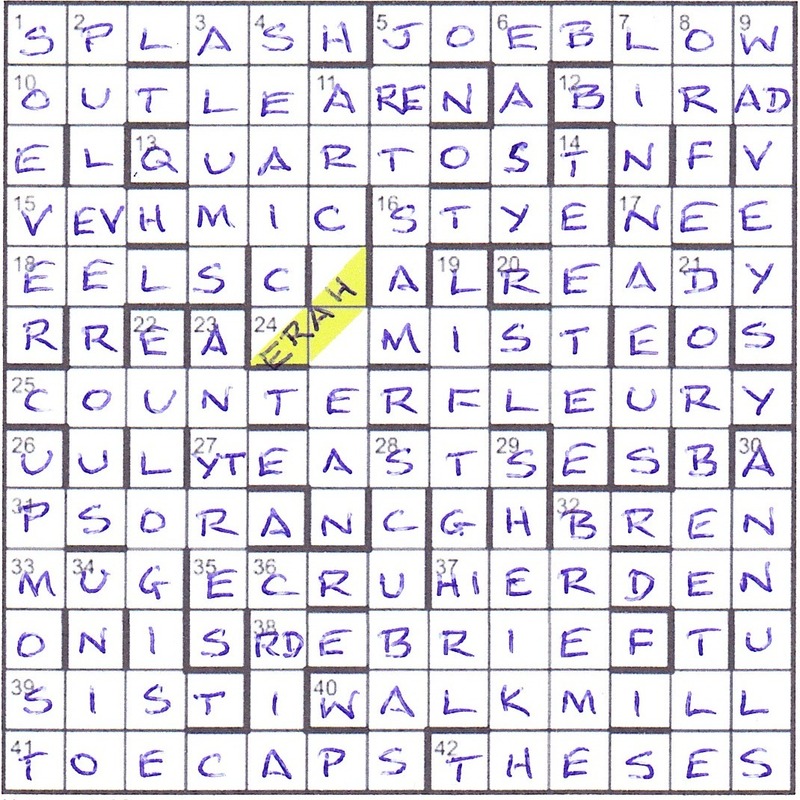 I was impressed by some of the wording that Poat used in his clues. For example, 31ac Early doctor’s rash openings in pursuit of appendix (5) had early doctor indicating an obscure medical term and PS was the appendix! Elsewhere, LINNAEUS was described as a ‘family organiser’, and the ‘Holland’ at 35ac had nothing to do with the country (despite its capital letter), but referred to the fabric. The most amusing clue was 39ac Relieve dreamer of soft drink to check case in Scotland (4) for SIST — FANTASIST – FANTA! I guess Ampthill must have rung a distant bell, because I had a sneaky feeling that we were dealing with the Masquerade treasure book from the late 1970s. This was a book by Kit Williams containing a story, sixteen paintings and clues to the whereabouts of a jewelled golden hare. Googling revealed that the clues in the book did indeed lead to the phrase Close by Ampthill. I did buy the book, but got absolutely nowhere in deciphering the clues from the paintings. The final bit of the preamble told us that, “having followed the trail”, we must “highlight the ultimate goal in the search area (four consecutive letters in a straight line).” I started looking for a hare and/or Ampthill in the grid. I also tried to find any reference to the monument to Catherine of Aragon which stands near the hare’s burial place. I tried a number of ideas before I decided that tilting the letters at 45° and positioning them carefully in their cells enabled the HARE to be read in a straight line, sloping north-east to south-west. Lawks! This was a complex solution, but I felt that I had identified all the clues and carried out all the instructions. Of course I got it right! This entry was posted on 18 November 2016 at 4:00 pm	and is filed under Solving Blogs. Tagged: Poat. You can follow any responses to this entry through the RSS 2.0 feed. You can leave a response, or trackback from your own site. You weren’t the only one: I came to exactly the same conclusion as you did. The fact that the highlighted HARE was part of a connected SEARCH AREA sequence in the grid surely had to be significant! I did consider highlighting the preamble, but ruled that out because it didn’t fit the standard way of sending in solutions to St Albans with a preamble cut off. That was the final clincher. I’m glad I wasn’t alone here,Tony, although you have my sympathy for finding the best wrong solution! I think having SEARCH AREA in the grid was one red herring too far. I will just add that the St Albans argument didn’t sway me since JEG has always said that the trimming of entries is a request, not a requirement. I considered that option but for me it didn’t sit well with the bit in the preamble ‘both letters must be entered side by side so that they spell out an instruction’. I thought that the HARE running from veHemic to joEblow was more likely. SEARCH AREA in the grid does bisect it, which seems reasonable to me.